It was a venture into the bylanes of Chandni Chowk, during my days of covering heritage as a beat at The Times of India, when I earned upon myself the wrath of a haveli (mansion) owner. Or was he a squatter? Off Lal Kuan, in Chandni Chowk, is a massive arched green door. On a hot, sunny afternoon I stood outside it. Strong waves of apprehensive swept through me as the door was opened cautiously and I was admitted after explaining that I was after a story. The door was shut with a thud behind me. The wood seemed thick enough, not to let any sounds penetrate its thickness. Indian National Trust for Art and Cultural Heritage (INTACH) grades the building of archaeological value A and lists it as belonging to Ahsanullah Khan, but the residents preferred to refer to it as Haveli Mehmood-un-Nissa after their grandmother, who happened to be Ikramullah Khan’s begum (wife). Among the two rooms which had retained the original Mughal architecture, the one with balconies witnessed many a bismillah (a religious occasion when a child is ready to read the Quran), reminisced Nazma Ghalib, the granddaughter of Ikramullah Khan. Arched gateways, diwankhana (hall), a courtyard and roshandaans (small windows that serve as skylight and ventilation) had given way to modern alterations — though decorative features like intricate mouldings in plaster could still be seen in the courtyard and some of the rooms. “Our relatives headed for Pakistan during the Partition, so most of our property is gone. The government acquired some land for the two schools here. But the Excelsior theatre is still with us,” noted Khusro Khan, the son-in-law of the family. While there was no trace of the nahar (stream) which flowed from Red Fort to the courtyard of Ahsanullah Khan’s haveli and other mansions in the area, such as Zeenat Mahal, major portions of the building were locked and in decrepit condition. There was also a secret tunnel, through which Hakim Ahsanullah Khan is said to have met the emperor sometimes. Unfortunately, I had no evidence of it at hand. According to INTACH convenor O P Jain, who was my source at the conservation centre, the mansion was in need of immediate attention because its Turkish hamams (baths) were on the verge of disappearing and the original plaster peeling off. “Though the family may not invite an intrusion in what they term private affairs, INTACH can provide expertise and the government can help with grants for maintenance of such unprotected buildings,” Jain had pointed out. But I have my doubts about whether Jain and his organisation could make any inroads into the haveli. The haveli is still one of the best in Shahjahanabad or Old Delhi, though major portions of it were burnt in the aftermath of 1857, as the grand old hakim was suspected to be secretly negotiating with the British. The tale goes that he died in 1873 in Baroda. “ I was in my house that evening and was unable to get out of the Fort owing to the vast crowd of sepoys in the Bazaar and at the principal Gate. On the morning of Friday [18 September] I sent a man who returned saying the door of the Diwan-i-Khas was closed. I heard nothing more. But in the afternoon of the same day one of the residents of the Fort ascertained the fact I have recorded [that the King had fled]. Being astonished I wrote a petition to the King asking the reason of his departure without informing me of it. In the evening a reply came summoning me and saying that a verbal explanation of the King’s bad case would be given me. In reply to the above I sent another petition in the morning stating that my bearers and syce had run off and that I had no means of travelling, that if His Majesty could furnish me with a conveyance I would go off at once to him.In the afternoon of Saturday two elephants came, on one of which I placed my things and on the other my brother Hakim Ghulam Najaf Khan and myself. We started for the Court towards the close of the afternoon. On the road the mutineer army abused me and called me a Christian. In short, I reached the King in the evening and at night the conversation turned on the conduct of the army to the King. The King said, ‘Well, what could I do against them?’In the morning I saw the whole army in retreat, and after them came Bakht Khan, with the Risaldars. He importuned the King go with him whithersoever he went. I said, ‘You have just escaped to this place from the Fort, where will you wander with these runaways? We must now trust to our Fate. Be pleased to remain here. Wait for an answer to the mukhtarnamah sent yesterday to Captain Hodson (Hodson Sahib) by the Queen through Mirza Illahi Bakhsh. Perhaps some chance of bettering ourselves may turn up, though the time has gone for that.’ The King then told Bakht Khan, that he could not go with him, saying, ‘Whither will you wander in your ruined condition. If you could do anything why are you running away?’ He answered, ‘The Hakim who is in league with the English is leading you astray, you’Il suffer for it in the end’. He then brought a palki and wished the King to start. At last I told the members of the Royal Family to talk to the King and not allow him to proceed, that if he did accompany Bakht Khan it would be a great misfortune. If he were seized his life would be in danger. Many of the Royal Family forbade his going, and much abuse was bandied about. The officers, being unable to effect their object, went off. A parwanah was written to Mirza Illahi Bakhsh to settle matters quickly and come over. The order was sent to the Arab Sarai (near Homayun’s Tomb) forbidding any conflict with any of the Governnent (English) people who might come there. Several orders were sent in succession to the mutineer army not to encamp at the Tomb, but to go where they list. In the afternoon Prince Muhammad Azim came with his troops and wished to encamp at the Tomb. He was ordered to go on, and not stop there, for His Majesty had lost all confidence in the rebel army. In the morning Qadir Baksh came and he also asked the King to accompany the army. He also got his answer, and was told that the King would await his fate, that he now placed no trust in anyone but God. After 12 o’clock Mirza Illahi Bakhsh arrived and stated there was a pass for the safety of the Queen and Mirza Jawan Bakht, andSamsham-ad-Daulah [the Hakim] and showed an English signature, probably Hodson Sahib’s. He said that on condition that all present would lay down their arms and the King go off alone in his palki, he would be allowed to remain in the Queen’s apartments, and that other particulars would be settled hereafter: that Maulvi Rajab Ali had come with 25 Sikh Sawars to the Tomb and that Hodson Sahib would come to meet the King. Absolutely fascinating ! Must have been quite an experience …………..it is amazing with time how things change and yet their stories are so interesting . Wonder , how many more of such havelis and families exist in and around Delhi . Also , if ASI or INTACH have done anything since then to the Lal Kuantan Haveli . Indeed , very brave of you to go on this mission ! 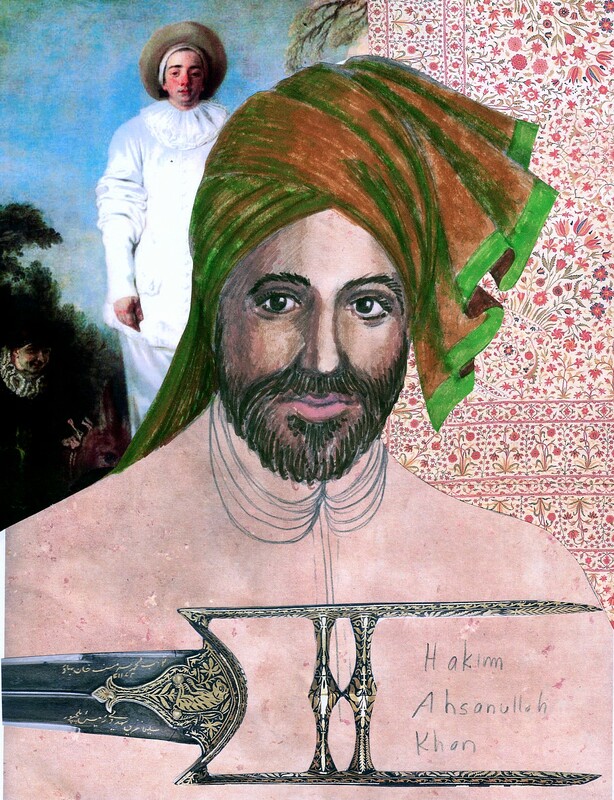 Hello there would you be kind enough to let us know of the source of Hakim Ashanullah Khan’s excerpt that you ref ( -pp 138 -147 of which publication?) looks to be fascinating reading. Well if you do a quick search on google with the date I have provided at the end of the piece and the name of the publication, you should be able to find it easily. Cheers.